The perfect reference for all students aged 11-14. A combined dictionary and thesaurus, in a handy Pocket format, it has been developed with teachers to be the perfect tool for both school work and homework. 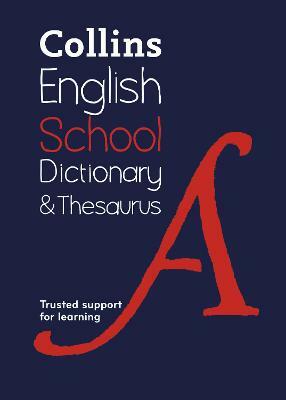 A new addition to Collins' bestselling range of Pocket dictionaries, this School Dictionary and Thesaurus is an invaluable reference book in a handy, portable format. Clear, straightforward definitions reflect today's language, while the matching thesaurus entries provide a generous choice of synonyms and antonyms. The Choosing the Right Word supplement helps with frequently confused words to improve your command of the English language. You can always rely on Collins to provide you with today's English as all our definitions, examples, idioms and usage notes are based on the Collins Word Web - our unrivalled and constantly updated 4.5 billion-word database. Also contained is a handy supplement offering practical guidance to help improve your English.